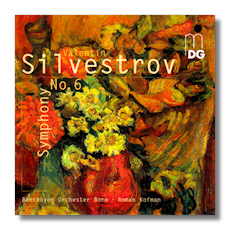 Silvestrov's music could be described as the next link with Shostakovich with its long periods of brooding silence and general sense of foreboding. The Sixth Symphony is one of his most appealing works carrying some psychological baggage when the composer was persona non grata in his native Ukraine but otherwise is replete with distinctive power and an inner sense of deep redemption. Roman Kofman is very much attuned to the work and with their ongoing Shostakovich cycle reaching new accolades, the Beethoven Orchestra of Bonn are well nigh ideal interpreters with a genuine feel for this difficult music. MD&G's recording is excellent in all departments and one hopes for more symphonies by this enigmatic composer from these forces in the not too distant future.